This test could be used for Chorus students as a simple review of note/rest names and values, as well as simple rhythmic math. 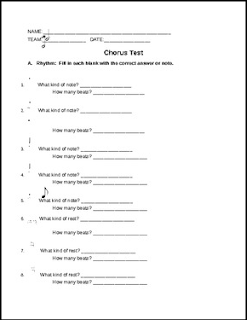 Also included are questions involving meanings of dynamics and time signatures, and solfeggio names. Introduction to Harmony: Ostinato, Partner Song, Round, Countermelody, Accomp.